What is an End Condition? An end condition is simply the rule that causes a game to end. Chess ends when one player's king is checkmated. Uno ends when one player gets rid of all of her cards. Settlers of Catan ends when one player reaches a certain number of points. Bohnanza ends when the players go through the deck of cards a number of times, and Citadels ends when a player builds 8 district cards. End conditions are obviously vital to a game because at every decision point players need to know how close the game is to ending. So: what kind of end conditions are there? Many traditional board games like Uno and Chess couple their end conditions with their win conditions. Simply put, the player who ends the game wins the game. In Uno, when a player plays her last card, the game is over and she wins. Settlers of Catan also employs this model. 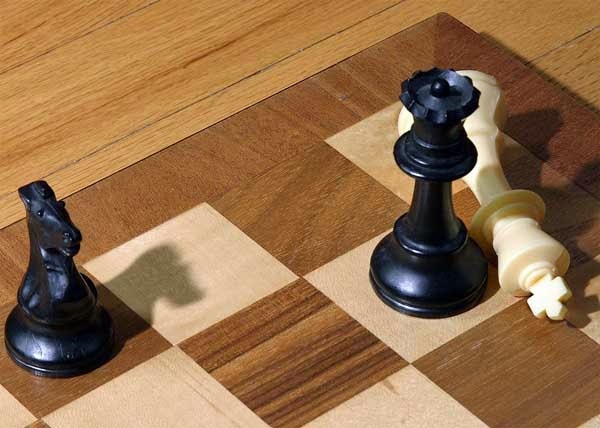 Checkmate causes the game to end, and the checkmating player to win. Benefits - This is a very simple model to understand, so it's a good one for lighter games. There's no counting or tallying up after the end of the game to take players out of the action, because as soon as it's over players know who won. Drawbacks - As you might imagine from a model used extensively by traditional board games, coupling the end and win conditions has several major issues. When I wrote about hidden scoring, I spoke of how knowing other players' scores can cause players who are not doing well to give up if one or multiple players have a large lead. When end and win conditions are coupled, that frequently means that players' statuses in the game (how well they are doing) are public. Uno is still a great example of this - in order to know when the game is going to end, the players have to know how many cards are in each player's hand. This means that if one player is ahead of the others, the losing players can give up. The only solution to this is make players' states unknown (for example, with hidden scoring), which is great in many games, but enacting this solution in games with coupled end and win conditions means that players have no idea when the game is going to end, which is rarely desirable. Also, in many of these games the first player can have an advantage as she gets one more turn to claim victory than the other players. In order to solve the problems of coupled end and win conditions, many new board games uncouple them, making the win conditions some sort of scoring, and the end condition dependent on some sort of game clock, such as a number of turns elapsing. While many, many games could work as an example of fixed uncoupled end conditions, Small World is a clean example - the game ends after a fixed number of turns, and then the player who has the most victory points wins. Bohnanza is another good example, where the clock is determined by when the deck runs out (or is gone through a number of times). In games with uncoupled win and end conditions there is almost always a moment of reflection at the end of the game, in which the players spend some time to answer the question: "now that the game is over, who has won?" When the clock strikes turn 8, it's time for MATH! Benefits - Clocked end conditions are also fairly simple to understand, although not as simple as coupled end/win conditions, and this makes them appropriate for medium complexity games (like family strategy games). By virtue of the end and win conditions being uncoupled, the problem with coupled end/win conditions can be easily averted; the clock is visible to all players, so they know when the game is going to end, but the win condition (usually victory points) can be hidden or at least partially obfuscated. Clocked end conditions can also be designed to scale fairly well with different numbers of players to control game length. 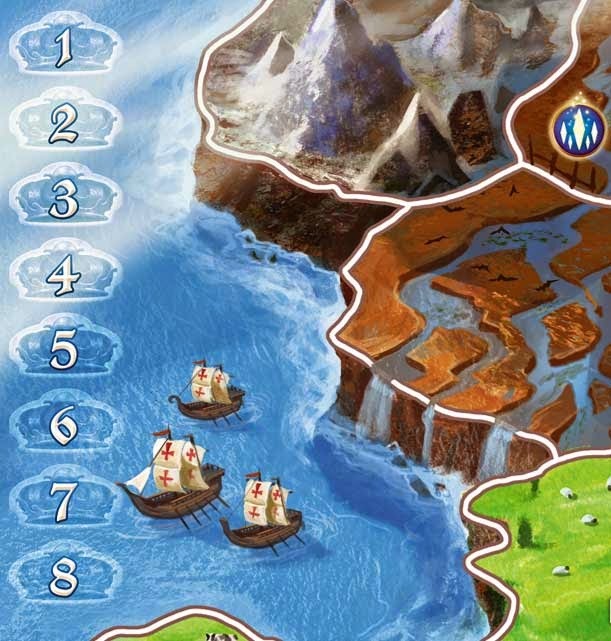 Small World, for example, has a different board with a different game length for different numbers of players. Finally, games with clocked end conditions can be designed to minimize first player impact with rules like "once the clock runs out, finish the round." Rules like this one can make sure everyone has the same number of turns. Drawbacks -There are few distinct drawbacks to this type of end condition, which is why it's so prevalent in new games! Where the fixed end condition was created as a solution to problems in coupled end/win conditions, the variable end condition is a design that aims to add more gameplay depth. At first glance, variable end conditions look just like clocked end conditions. In both cases, the end and win conditions are uncoupled, and when some end condition even occurs (usually a resource running out). The difference between fixed end conditions and variable end conditions is that in the latter case, players can directly influence when the game ends. Citadels serves as a great example of a game with player influenced end conditions. Citadels is an engine building/set collection game in which players pay gold to build 'district' cards, which are collected in front of them. The game ends at the end of a round when any player has 8 district cards total in front of her, and then the player who has the most points (based on most valuable districts, and variety of districts' suits). Benefits - The variable end condition is widely used in medium to heavy strategy games because its very existence can add another strategy to the game. In the Citadels example, there are a number of different strategies a player can take during the game. She can go for a variety strategy, collecting districts of many different suits. She can attempt a single-suit strategy where she only collects buildings of one suit in order to gain the benefit of role cards which give her gold for each district of a particular suit that she has. In either case, she wants the most valuable districts she can get. With the addition of the variable end condition, another strategy emerges: the short-term strategy. Variable end conditions, when designed properly, can allow players to attempt a fast game strategy in which they opt for short-term gain and then try to force the game to end quickly in order to leverage this advantage. In Citadels, this means buying many small, less valuable districts in order to rush to the 8-district end condition quickly. Drawbacks - The main drawback of the player influenced end condition is that it can be tricky to design. Here are some tips! The tradeoff the designers have chosen to make here is to increase depth of play at the cost of increasing first-play complexity. Whether or not a similar tradeoff is worthwhile in your game depends on the amounts of each being added, your target audience, and your design philosophy. Introduce rubber banding - Player influenced end conditions can be a great way to introduce rubber banding (or negative reinforcement loops), as you can make one of the game end conditions waste a better action to initiate it. For example, players in Race for the Galaxy or Citadels can come to a point in the game in which they can play a small, cheap card to end the game, or they can save up to end the game in a future turn with a card that's worth more points (giving their opponents a chance to catch up). Ending the game must be inevitable - One catch worth noting in adding rubber banding via end conditions: the key here is to make sure that not ALL of the end conditions are rubber banding, and that there is at least one compulsory end condition. An example of this problem is a game I've been working at Tiltfactor that has player influenced end conditions. This end condition was one that usually happened naturally during gameplay, and was intended to balance short term (rush) and long term (engine building) strategies. A player playing a rush strategy would could take a few sub-par actions to end the game earlier than normal, and hopefully beat out a slower opponent. The problem was, in an earlier version the game was so well balanced that skilled players taking a long term strategy often found themselves so close to each other in score that even if a player was ahead by a few points, causing the game to end was enough of a sub-par action to allow her opponent to overtake her. At best, this meant the game would drag on a very long time while one player pulled into the lead enough to safely end the game. At worst, this meant the game would never end. The solution we eventually implemented is one seen in many games with player influenced end conditions: we added the end condition of exhausting the victory points. This solves the problem nicely, because no matter what the players do, if they're trying to get ahead of their opponents the victory points will eventually run out. Player influenced end conditions can be a powerful tool for adding depth to strategy games when implemented well for the right kinds of games!